Simple Systems: Organize Your Pictures Even If You're Really Far Behind! Simple Systems: Organize Your Pictures Even If You’re Really Far Behind! With the current digital media age, there are pictures EVERYWHERE. Facebook, Instagram, your phone, your spouse’s phone, text messages, google photos, your email, your computer, and on and on. This picture overload makes it feel really hard to know how to organize your pictures. You can do it though! 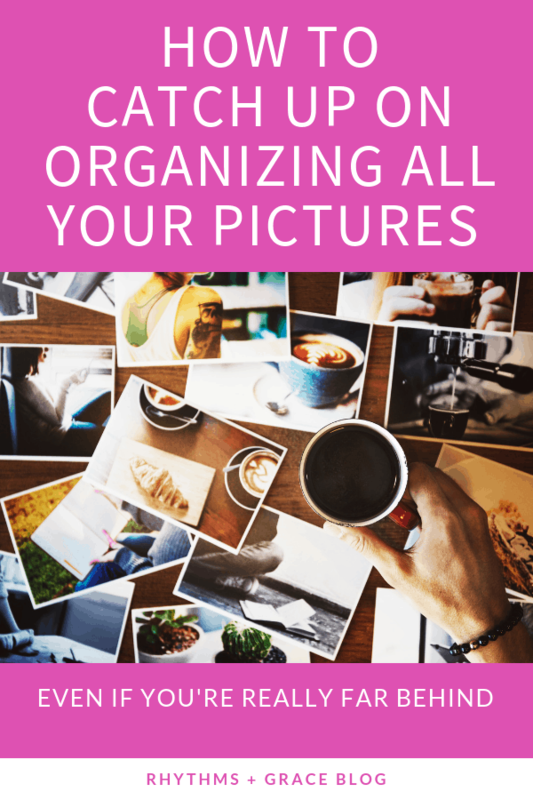 I’m hoping to simplify the “problem” today and give you a manageable solution for how to organize your pictures… hopefully without losing your mind in the process. The main reason I organize my pictures is to make an annual family photo album (Check out this article for a few pictures of our annual albums.) Blurb is my favorite custom book tool, and Mixbook is my favorite click and drag bookmaking site. This post does not cover WHERE to store all your pictures. If you’re deciding between iPhoto, windows photos, the cloud, a hard drive, Google photos, amazon photos (and on and on), check out my thoughts on which program makes the most sense for most people! The main “trick” here is to understand the following steps and then schedule a time to organize your pictures every single month. I write it on my calendar, buy some wine, and spend a couple hours on it after the kids go to bed, usually with a show on in the background while my husband is geeking out – coding next to me. It takes me about 2 hours because I take a LOT of pictures, both on my phone and with my DSLR and I like editing them. You could easily spend less than 2 hours once a month and still stay on top of your pictures. Grab my free printable cheat sheet and post it somewhere that will help you remember your monthly photo-organizing session! It has all 8 steps to organize your pictures! If you haven’t organized pictures in 10 years, don’t get discouraged. Here’s what you can do to ‘catch up.’ First of all, START CURRENT. Just commit to doing this month’s pictures. Forget about going back for now. Sometime in February, for example, block out an evening to work through January’s pictures. It might feel slow the first time, but eventually this process will get faster and easier. Develop the habit of doing this for a couple months. THEN, you can go back and try to catch up. Once you’re current, the easiest way to catch up is to set small goals. Do the current month + 1 old month each month. Don’t do more than that if you’ll get overwhelmed. If you have the freedom, flexibility, and endurance to block out an entire Saturday to get caught up, fine. But most people would rather drink bleach while poking their eyes out. So, I suggest small progress. Baby steps. 1 old month + the current month. You can do it! TIP: To make the gathering process less tedious, get in the habit of immediately saving anything shared with you to your phone album. If someone texts me a picture or I see one on Instagram/ Facebook that I want to use in an album, I save it on the spot. That way, when I’m gathering photos at the end of the month, I don’t have to go back through Instagram, Facebook, and texts. I’ve already saved the pictures I want into my regular photos album. I do the same thing with email. If someone emails me a picture I want to use in an album, I immediately download it and put it in iPhoto. Then, it’s already there when I go to organize the pictures for the month. If you take a lot of pictures on your phone, go through them a few times throughout the month while you’re on the treadmill or watching a show, and delete the crappy ones. This will save you time during your once-a-month upkeep session. I used to organize pictures by event, but I’d find myself looking through my pictures folder trying to remember the name of a particular event.. was it called John and Julie’s Wedding, or Smith Wedding? 20 minutes later, I’d find a folder called something ridiculous like “JJ Wedding Best Ever 2015 Summer.” Organizing by month keeps things simple and prevents a lot of painful searching! If you take a lot of pictures, go back through and delete more! Digital picture overload makes creating albums and products paralyzing. I’ve learned that from experience. It’s nearly impossible (and annoying) to sift through the hundreds and hundreds of pictures I have from my oldest daughter’s first year of life. If you care about the shadows, lighting, colors, etc… go ahead and edit the remaining pictures in your folder. When I used iPhoto, I usually just clicked “enhance.” Ocassionally, I also used lighten, and contrast. In Google Photos, if I have time, I hit “auto.” The auto edit feature really makes a difference, but when I get behind, I skip the editing and just get the pictures sorted and in my albums! If editing sounds overwhelming, skip it. Once you’re done gathering, deleting, and editing, it’s time to backup that month’s pictures. cloud – Amazon has photo storage for prime members; I use Google Photos; the iCloud is another option but I find everything about it infuriating even though I have a Macbook and iPhone, so I never use it. Ever. I would destroy it if I could. Call me old school, but for years, I still backed my pictures up to a hard drive every month. But, I’ve lost my hard drive a couple times, which induces extreme panic. Every time that happened, I would resolve to move my backups to the cloud. I finally moved all my pictures to cloud backup in 2017 and haven’t looked back. I moved everything on to Google Photos, and I LOVE IT!!! (Here’s a step by step Google Photos tutorial if you’re interested!) YOU CAN DO THIS! Here’s that printable cheat sheet with all 8 steps for how to organize your pictures. Post it somewhere as a reminder. 9. Honestly, making up your mind is the biggest thing. Decide you want to organize your pictures, and then start. As with anything, it will get easier the more you do it. Don’t stress about what you miss, or what’s undone. The point is to be preserving memories for your family in the future. To quote another blogger I like, “it doesn’t have to be perfect to be beautiful.” Just go for it! Good luck! May the force be with you!! Comment below with any questions or photo organizing tips of your own. Tired of being in mommy survival mode?! I have a 5-day email course that walks you through the step-by-step process of identifying the things that drive you the most crazy, and figuring out how to change them in a way that works for your current season of mom life. The course is all about figuring out what rhythms + grace looks like for you right now! You can start the email course today by clicking below. Thank you ever so much for your photo tutorials. They are the best, and easiest to understand for me, a not-so-tech-savy grandma. I have not got everything out ot them yet, but I have a start. I have an Android so there are some differences there. I have saved them in my Pinterest board for future referral. Thanks and hugs.. Elsie!! Oh my word, I know what you mean. Haha iCloud has always driven me nuts… I’ve never been able to figure it out. My google post explains why it’s not a problem that Google doesn’t keep full res photos… unless you’re a pro photographer!? Check out that other post and see if it answers your questions. If you sign up for my photo organizing cheat sheet, you can always hit reply to an email too 😉 good luck!! I am at my wits end with ICloud. I feel like it’s stilen my photographs because it makes it impossible to download ALL your iCloud photos onto a hard drive. I want to know I’ve got all my photos on a hard drive AND in the iCloud. The process is unfathimable, impenetrable IMPOSSIBLE! They’ve removed the select all button for bulk download. I’ve spent hours online trying to sort it and even went into an Apple shop and they drew a blank. I am worried that Google does not keep full resolution images on its cloud server – is this right? Because that would worry me. I have 3 years of images on iCloud and about a decade in iphotos on my hard drive. You seem to know what you’re talking about so I am going to read all your blogs and links. Thanks for putting this altogether – wish me luck!! This is one of the best posts I’ve read lately. Truly appreciate you keeping it simple, encouraging progress vs. perfection and providing a clear action plan with wiggle room based on how much time you have and where you are in the process. So many blogs are unnecessarily long and wordy to gain ad space…thanks for the clean, clear and helpful post! oh good! Glad they’re helpful! good luck! yes you can!! Good luck!! Oh, wow I can’t tell you how encouraging this is. I’m a former-ish photographer (set the $-making aside to focus on other things but still take a TON of pictures!) and I’m only “caught up” on my family photo archive to about, oh, 2014. CRINGE. It’s just so daunting. But then I think, oh CRUD if my hard drive crashes — ok, I have most backed up on an external drive — or my house burns down I would lose YEARS of photos!! All those memories! All I’d have would be Instagram! Which is still a lot but nowhere near all of them. Thank you for giving me permission to take itsy bitsy bites out of this YUGE project. Short assignments: it’s a tenet I live by in my work as a writer, but one I have trouble applying to the rest of life (um, clearly). So, yay! I’m sorta looking forward to tackling LAST MONTH’S photos in the next few weeks. I can DO this! Ay ay ay. That’s a lot! haha! But what a gift 🙂 I would say, just dive in. Use the same strategy – one month at a time. Maybe make a checklist of years that you can check off as you go through to track your progress and stay motivated to finish. Give yourself a reward at the project’s end! And give yourself a deadline. The good news is – there won’t be a LOT of photos from the “good ‘ol days” before cameras were so easily accessible. So those years should go quickly hopefully! Good luck!! Do you have any suggestions for someone who has over 90 years of photos. I have my mothers and grandmothers. I recently bought a new Mac, which comes with “Photos” and I really don’t like it! Used to love “iPhoto”! Don’t know why they stupidity delete Events, it was so much easier to import from different devices and move pics to same event, also avoiding duplicates… But now?! I can’t get my way around Photos: Memories is too much authomatic and I can’t make it do what I want, doing album is basically a manual process and u may end up with lots of duplicates. So at the moment I set Photos apart and just work on folders manually… My issue is that I have so many pics taken from different devices and would like to have a platform to sort them out, like with Events Inn iPhoto… Any suggestions? oh good!!!! 🙂 So glad! Hey Erin, I don’t keep the photos on my computer at all… they all go into Google photos for backup. I used to backup onto a hard drive as well, but I don’t anymore. If you want to put them on a hard drive, just make a folder in Google photos, then download it. It’ll download as a zip file in your “downloads” folder on your mac. Then, unzip it, move that folder to your hard drive and voila. Empty your downloads folder into the trash every so often so you don’t have a bunch of big files in there. I found the mac process really frustrating too… how they were all in different spots. So I stopped putting them in my mac photos app all together. I turned off the auto backup from the mac photos app on my iphone and they only go through Google Photos now. Does that make sense? Basically, I use a macbook & an iphone but have everything Apple turned off (because I found it confusing) and everything Google turned ‘on’ so that nothing ended up actually on my mac… just on the internet. Glad this helped!! Hmmm good point about the contradictory advice – oops!! When I initially wrote this post, I had auto syncing turned off. Now that I use Google Photos, I do leave it on for ease. BUT, it does clutter my photo library in Google Photos. I go through frequently and delete the duplicates. I need to update my advice in the post, but I would say it’s a judgment call/ personal preference. If you don’t want to manually backup frequently, then you might want to leave auto-backup on for Google Photos and just deal with sifting through the duplicates and deleting them manually. If you DO backup frequently and don’t want to deal with sifting through & deleting, then do that. What program can I use on my PC to organize pics? I used to uses Picasso and that was pretty good. But there is no download for it anymore. Got a suggestion? I am way, way, way behind in my photo organization but determined to get to it. I stared with your your blog post about Google Photos, set up a command center with all the printed ones in tubs and have many backed up on a hard drive. I am confused by this comment: I Because I frequently go through my phone and delete, I have all auto-syncing between my phone and computer/ cloud turned OFF. Otherwise the 20 crappy versions of the picture make it to my computer before I get to deleting them on my phone. This is different than the advice you gave in the Google Photos tutorial….can you explain? Also, when you say do this for the current month and one older month (great advice) do you do print albums, google photos albums or…what is your suggestion? Thank you for your post! It is great to read about other peoples path to photo organization. I especially like the idea of Once of Month Photo Club, scheduling that time away from distractions to organize all the photos in your life. Hi your blog is superb, so logical and simple making it very easy for people to understand and use. Non of the waffle found on some other sites. I couldn’t agree more on your advice to delete then go through and delete again. I know so many people who keep every picture and insist on showing them all, even the ones with heads missing! I use a very similar structure for my files using lightroom. I also within lightroom use keywords for quick access. I could just type in my daughters name for example and all pictures of her will come up from all files, same with any topic I’ve used as a keyword. Hi Fi, Thanks for commenting. I think you’re right about iPhoto… I’ve updated my mac routinely and for some reason, it hasn’t switched to Photos. But I think that’s a fluke. Lucky me. I’m in the process of switching to google photos in place of iPhoto because I assume it won’t be accessible for much longer. My main issue with iCloud is that I don’t understand it! So, that’s more a “user error,” than Apple’s fault. Haha! It seems expensive for the space, plus I have trouble navigating around compared to google. I use google drive and gmail for most of my online work, so adding google photos was a natural fit for me. Plus it has organizing capabilities within the software. Sharing is super easy. It has fun video and collage compilation tools. The search feature is amazing. And, it allows me to delete & edit within google photos app from my phone… so if I delete a picture from the app on my iPhone, that picture is gone from my backup in google photos too. I like that there’s no redundancy. I’ll likely post an update about how and why I’m using google photos soon, but that’s the gist! Sounds like you have a good system too!! Readable and logical! I do try to keep mine reasonably organised, but I can take hundreds in a day if I go to an event or place of interest, so it can take a while. However, your suggestions do make sense. I’m not sure iPhoto is around anymore (?) I only got my first MacBook last year and almost straight away iPhoto changed to Photos. I downloaded Photoscape and use that for editing. Out if interest what issues do you have with iCloud? It makes sense what you said about deleting rubbish before it can get to your Mac if you have all-sync on. I irregularly back up to an external hard drive with RAW files and my final edited photos, as well as Google cloud. Really helpful piece, which I found through Pinterest. Hi, this iPhoto that you mention. Is this something is found on a Mac ? Jim, great naming idea!!! i forgot to mention in the post I add a number in front of my months so they’re in order too… i.e. 01 Jan / 02 Feb/ 03 March etc.. yours is even more detailed 🙂 Thanks for the tip! Enjoyed your post. Organizing photos is certainly a constantly ongoing project. However, I use a slightly different storage naming process that has yet to fail me in over 12 years and 10,000+ photos. For photos, simply name the folder using the standard naming convention below. – Then, a brief description of the folder/document. This naming convention automatically sorts documents chronologically. Then, I use the folder structure to divide documents by event, subject or type. You can then easily search by date or event as well. As a reminder, backup your drives regularly (weekly / monthly) to external hard drives and/or cloud based storage services! I will definitely read it, your wording and simplicity is perfect. oh my goodness, Leslie!! Thank you!! I’m SO glad this was helpful for you. I agonized over the draft and have changed it several times trying to make it as easy to follow as possible! Did you read the post about google photos too? I’m going to switch this year to google photos and write a new post specifically for that option 🙂 good luck with your pictures! OMG I am so happy I came across your post. You are very inspiring and make it so simple to follow I love it and I am going to do it and share this post. I really enjoyed reading your thoughts and ideas. Thank you so much for sharing.